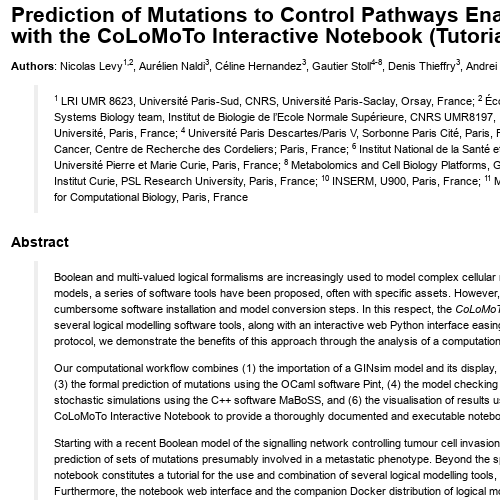 The CoLoMoTo Interactive Notebook relies on Docker and Jupyter technologies to provide a unified environment to edit, execute, share, and reproduce analyses of qualitative models of biological networks. You need Docker and Python. We support GNU/Linux, macOS, and Windows. The container can be stopped by pressing Ctrl+C keys. Having issues? have a look at our Troubleshooting page, or open an issue. 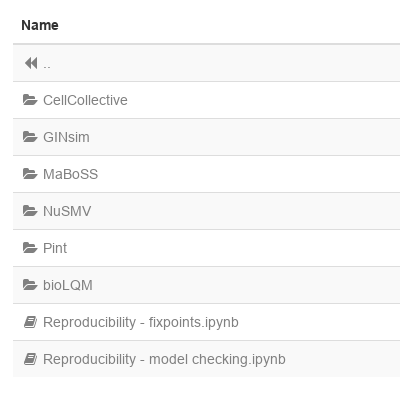 From the above links, you can download the notebook .ipynb files to upload and re-execute them in your running CoLoMoTo Jupyter web interface. You may want to replace next with any other suitable colomoto/colomoto-docker tag. You should also consider using a persistent tagging policy. docker build -t your-docker-image:your-tag . Contributions are very welcome, being for adding new software or improving the user experience. Consider opening an issue on GitHub and reading the CONTRIBUTING guidelines. Questions? Bugs? Requests? Open an issue on GitHub. You can also reach us at colomoto.org.